INTPs are the quintessential “Thinkers” of the Myers-Briggs® type community. Gifted with a strong sense of logic and a boundless imagination, INTPs bring innovative thinking to the forefront of their lives. 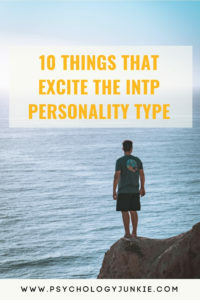 Today we’re going to talk about 10 things that bring an INTP joy. Read on to find out what they are! Abstract ideas, inventions, and possibilities bring life and wonder to the INTP spirit. These types would much rather explore a conceptual idea than something tangible or pre-existing. What “could be” will always be more fascinating than what “is”. Exploring ideas in the boundless world of the mind is a thrilling experience for INTPs. INTPs aren’t afraid of doing some mental gymnastics when life gets predictable. Puzzles, conundrums, riddles, and complex mathematical problems can all provide a fascinating escape from mundane daily life. According to the MBTI® Manual INTPs are over-represented among types who enjoy “Appreciating Art” as a leisure-time activity! This coincides with what I’ve heard from many INTPs who enjoy creating art, going to art museums, or looking at art online. INTPs tend to get bored if they aren’t mentally advancing and learning on a regular basis. Whether they’re developing their own video game or studying the nature of carnivorous plants, INTPs like to absorb all kinds of random and varied bits of information. In fact, according to the MBTI® Manual INTPs enjoy taking classes as a leisure-time activity! Think an INTP with an empty calendar is going to be bored? Think again! These personality types enjoy the blissful freedom of unscheduled downtime. With no expectations or plans roping them in they can pursue ideas, theories, games, music, or whatever creative pursuit their hearts desire. INTPs don’t shy away from a challenge, and that certainly applies to their gaming skills. They love the world of video games and board games, and enjoy the strategic and creative challenges that present themselves along the way. Music provides a therapeutic backdrop to all the analysis and imagination going on inside the INTP mind. Many INTPs I spoke with enjoyed creating their own songs, while others just used it to provide atmosphere for their overactive minds. INTPs are driven by their curiosity which makes them absolutely ravenous readers. INTPs absorb books. In fact, according to a study I conducted, the average INTP reads 48 books per year! Having an unexpected block of alone time is invigorating to an INTP. While they certainly care about their families and friends, they also feel revived and energized when they have time to themselves to think, experiment, play, or create. Many stereotypes of INTPs would imply that they are “robotic” or lack feelings for others. Contrary to popular opinion, many INTPs have a passion for understanding other people and why they think the way they do. Did you agree or disagree with this article? Do you have any insight to share? Let us know in the comments! I am very glad that you included psychology, art and music in the list. There are so many people who think that we (INTPs) hate people and are only interested in stuff like mathematics, natural sciences or technology. This may be true for some of us but certainly not for most (and not for me as well). But I really love psychology. I think there is nothing more interesting than understanding how others think and feel. Well, INTPs are probably the most introverted introverts and I often struggle in dealing with people. But I do not hate them at all. No, I find them incredibly fascinating. Agree with all of this. Being a great reader is not so much me though. Well, not 48 books a year anyway. I read articles for information rather than long imaginary stuff. Cancelled plans!! Damn right!! Lol. And what Lici said about art, music and psychology. Well, I’m an INTP counseling psychologist, go figure.